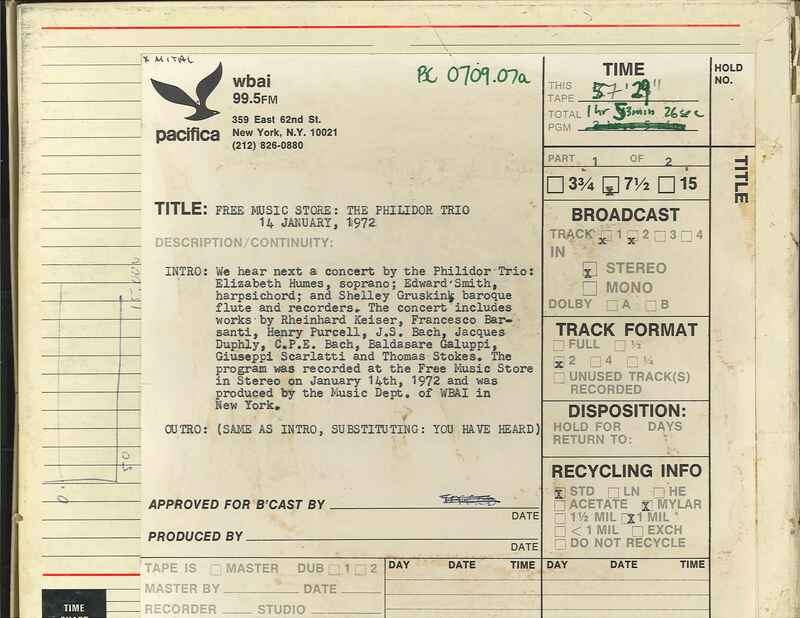 The Philidor Trio, consisting of Elizabeth Humes, soprano, Edward Smith, harpsichord, and Shelley Gruskin, baroque flute and recorders, perform a program of Baroque music and arias at WBAI's Free Music Store on January 14, 1972. The first half of this program includes a cantata by Reinhard Keiser; selected tunes from The bird fancier's delight; Sonata in B flat major by Francesco Barsanti; An evening hymn, I see she flies me, and A Scotch song by Henry Purcell; selections from the Anna Magdalena Bach notebook. This recording was formerly cataloged as BC0709.07A.